The SCORBOT-ER 4u robot is a versatile and reliable system for educational use. 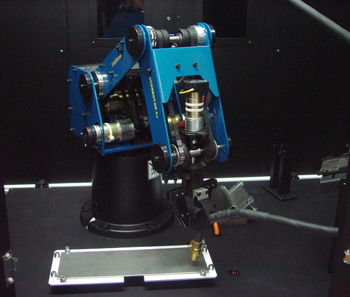 The SCORBOT-ER4u robot arm can be mounted on a tabletop, pedestal or linear slidebase. 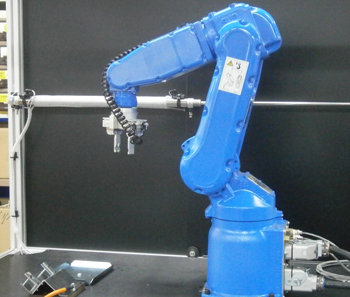 The robot’s speed and repeatability make it highly suited for both stand-alone operations and integrated use in automated workcell and FMS applications such as robotic welding, machine vision and CNC machine tending. The optional RoboCell 3D simulation software lets students design and control industrial workcells. SCORA-ER 14Pro with the state of the art USB-PRO controller facilitates PWM drive, PID control and continuous path, real-time, multi-tasking control. 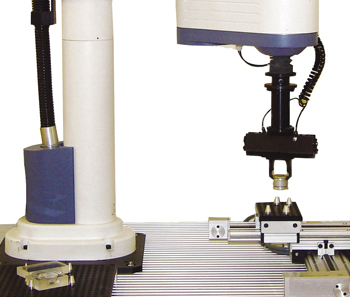 The programming is facilitated by a software interface while an optional hand-held teach pendant enables direct operator manipulation of robot axes and position recording as well as other functions. The ability to simultaneously control and synchronize up to 8 axes, 16 digital inputs and 16 digital outputs enables the user to have real-time control of both the robot and its application environment. Easily integrated with peripheral equipment, the SCORA-ER 14Pro system provides the foundation for both stand-alone application as well as robotic workstation within CIM systems. The MOTOMAN MH5F features a 706 mm (27.8″) reach and offers the widest work envelope in its class. Because of its small footprint, it can be floor-, wall, or ceiling mounted. The MH5F offers superior performance in small part applications such as assembly, dispensing, packagin, material handling, and machine tending. The compact design and built-in collision avoidance features with multiple robot control allow up to four robots to be used together to maximize productivity while reducing overall floor space requirements. This turnkey automated welding station gives students training and skills in production welding methods, robotic programming and control. Using RoboCell software students safely perform entire welding processes in 3D simulation before executing actual automated welding applications. Students learn to overcome common welding problems, such as thermal deformation, by adjusting welding technique. 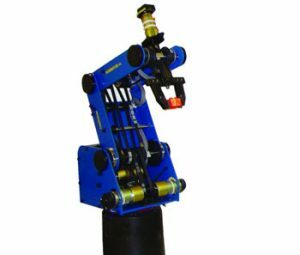 Students also learn to improve weld quality by optimizing important welding parameters such as wire feed rate, robot speed, inert gas shield and voltage. Safety is an integral part of the system. The robotic workbench is housed in a fire retardant metal booth with filter-plated windows for UV and eye protection. Opening a booth door automatically halts the welding operation. Pressing either of two emergency buttons immediately halts both robotic and welding operations.